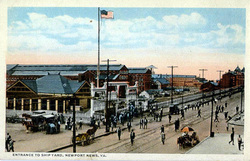 Located at the southern end of the Virginia Peninsula, Newport News was a rural farming and fishing village until industrialist Collis Huntington built a railroad line connecting the area to Richmond and points west in 1881. Huntington’s idea was to transport West Virginia coal to Newport News, where it could be loaded onto boats and shipped around the world. He soon added a ship terminal and coal piers, followed by a shipyard that would dominate the local economy for well over a century. Due to Huntington’s efforts, Newport News grew quickly. By the time the city was incorporated in 1896, it already had 9,000 residents. Its population would more than double by the turn of the century. The first Jews arrived in Newport News not long after Huntington’s railroad. Among the earliest was Beryl Oser and his family, who settled in Newport News in 1885. Adolph Rosenbaum, a tinsmith from Prussia, came to the city that same year, opening a small shop. The business grew into Rosenbaum Hardware, which was housed in a large three-story building by 1904. The hardware store remained in operation until 1966, although members of the Rosenbaum family still run a fencing company today. Austrian-born Joseph Reyner opened a ship chandler store in 1889 to supply the vessels docking at the city’s newly built port. By 1890, about 15 Jewish families lived in Newport News. Although their numbers were small, the Jews of Newport News worked to maintain their religious traditions. Many brought in kosher meat from Norfolk and traveled there or to Baltimore to observe the High Holidays. In 1890, they held the first High Holiday services in Newport News in a room above Louis and Charles Nachman’s store. Around the same time, they brought in Abraham Mirmelstein to serve as chazzan (service leader) and shochet (kosher butcher) for the community. Each year, the group met for the High Holidays in larger and larger spaces to accommodate the growing Jewish community. In 1893, after worshiping in the Casino Building for the High Holidays, they established a formal congregation named Adath Jeshurun (Congregation of the Upright) with 18 charter members. By 1894, Adath Jeshurun built a small, two-story wood frame building to serve as their synagogue. The congregation grew quickly, reaching 64 families by 1900. That same year, they tore down their small building and replaced it with a three-story synagogue that cost $10,000 to construct. Although the congregation was Orthodox, Rabbi Edward Calisch of Richmond’s Reform Congregation Beth Ahabah was the keynote speaker at the dedication. Orthodox Jews in neighboring Hampton and Phoebus started worshiping together in 1899. Officially chartered as B’nai Israel in 1904, the congregation had 17 members by 1907, meeting above a store on Queen Street. Despite its small membership, the congregation was able to Rev. I.K. Fisher as its chazzan and mohel (ritual circumciser) by 1906. B’nai Israel had a Hebrew School with 22 students at the time. In 1908, B’nai Israel built a synagogue on Eaton Street in Hampton. Photo courtesy of Peninsula Jewish Historical Society. By 1910, the Peninsula was home to two synagogues, both of which were Orthodox. Most of the area’s Jewish population was made up of relatively recent immigration from Eastern Europe. According to one estimate in 1910, 90% of the Jewish population of Newport News was “Russian,” while 8% was Galician, and 2% Romanian. There was never a significant number of “German Jews” in Newport News like there was across the bay in Norfolk. Not until the 1950s would a Reform congregation be established on the Peninsula. The Jewish immigrants who settled in Newport News and Hampton concentrated overwhelmingly in retail trade. By 1900, Jews owned at least 67 retail businesses in Newport News. Of the 25 dry goods stores in the city at the time, 16 were Jewish-owned. As many as 30 different grocery stores in Newport News were owned by Jews in 1900. Many of these businesses were initially located on 18th Street, the town’s first main thoroughfare, though they later moved to Washington and Queen Streets. Perhaps the most notable retail business was Nachman’s Department Store, opened by Sol Nachman in 1894. After the store moved to Washington Street in 1911, it eventually became the third largest department store in the state by sales volume. When Sol Nachman died in 1929, his wife Ida took over the store. In 1931, Nachman’s opened a new 60,000 square foot building to house the growing business. In 1954, Sol and Ida’s daughter, Rena Nachman Kates, took over management of the store. As owner of the leading department store in Newport News, Kates led the way in integration, and Nachman’s became the city’s first store to integrate its lunch counter in the late 1950s. Nachman’s remained Newport News’ leading department store until the family sold it in 1973. Joseph and Lena Beskin owned a dry goods store in Newport News by 1900. They later bought the Columbia Dry Goods Store, renaming it the Beskin Department Store. Joseph ran the store until his death in 1944, after which his children Theodore Beskin and Lillie Garner took it over. Theodore became president of the Newport News Retail Merchants Association in 1946. In 1917, Nathan and Morris Peltz opened a ship chandlery business. After a hiatus while Nathan served in World War I, the brothers reestablished it in 1920 as the International Outfitting Company. Later renamed Peltz Brothers, the business survived the lean years of the 1920s and 30s, and thrived during World War II when it received government contracts to outfit naval ships. Peltz Brothers had offices in both Newport News and Norfolk and remained in operation into the 1980s. Other Newport News Jews were involved with the entertainment business. 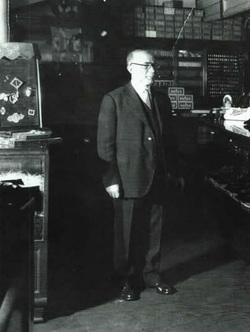 Abe Horwitz came to Newport News in 1896 and opened a clothing store. In 1912, he created the Newport News Shipbuilders minor league baseball team, and built a playing field he called Horwitz Park. William Gordon, who had previously been a tailor, opened the Palace Theater in 1917. 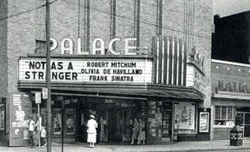 Showing motion pictures and featuring vaudeville acts, The Palace was one of the city’s most prominent theaters. After William died in 1926, his wife Bertha and their three sons Leonard, Julian, and Jerome Gordon took over the business. They expanded their operation over the years – by 1967, Gordon Enterprises owned two movie theaters, two drive-ins, a dance hall, a miniature golf course, and a local hamburger restaurant chain. Jewish merchants helped to create the shopping districts on Jefferson and Washington Avenues in Newport News. During the 1930s and 40s, Washington Avenue was home to such Jewish-owned stores as Nachman’s, Hofheimer’s Shoes, Hannah’s, La Vogue, Silverman Furs, among several others. Many of these merchants found it difficult to maintain traditional religious practices. By 1913, a small group of Adath Jeshurun members grew dissatisfied with the congregation’s strict orthodoxy. Desiring a modern religious school in which girls could take part and an English-speaking rabbi, the group broke away to form the Hebrew Bible Class Association. The split was relatively amicable as Adath Jeshurun allowed the group to hold its religious school and Friday night services at their synagogue initially. The association’s president, Ellis Graff, contacted Solomon Schechter, the president of the Jewish Theological Seminary, to recommend a potential spiritual leader for the group. Schechter suggested Dr. Moritz Speier, who was hired as the congregation’s first rabbi. Rabbi Speier, who led the congregation from 1914 to 1922, introduced confirmation and gave weekly Sunday night lectures on Jewish history and current events. The group grew quickly, reaching 119 members in 1915 with 175 children in its religious school. That same year, the association changed its name to the Newport News Hebrew Congregation. From its founding, the congregation embraced Conservative Judaism, an effort to balance Jewish tradition and rabbinic law with modern circumstances. Of the nine men who first founded the group in 1913, all but one were immigrants. Five were from the Russian Empire, while two were born in England to Russian parents. The group was young – only one founder was over 36 years old – but most had been in the United States for several years. Most had come to America as children in the 1880s or 90s, and wished to move away from the Orthodox Judaism of their parents. In 1927, the congregation formally affiliated with the Conservative movement. In 1918, the Newport News Hebrew Congregation, which met in various rented spaces during its early years, bought land for a synagogue. The building was delayed due to the effects of World War I, but was finally dedicated in 1922. Once the congregation settled into its first synagogue, they changed their name to Rodef Sholom (Pursuers of Peace). 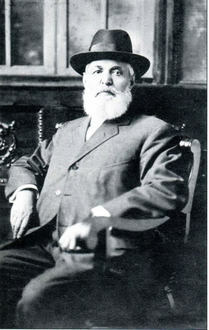 After Rabbi Speier left in 1922, Rodeph Sholom had a series of short-term rabbis until 1937 when they hired Rabbi Jesse Finkle. Rabbi Finkle would lead Rodef Sholom for the next 30 years. Women of the congregation established a Sisterhood in 1921, and quickly took a leading role in funding Rodef Sholom. Over the years, the Sisterhood paid for additional classrooms as well as the rabbi’s parsonage. During the Great Depression, when the congregation was struggling, the Sisterhood paid the mortgage on the building. Their most popular fundraiser was the annual cabaret show in which members of the congregation sang, acted, and danced for overflowing audiences each year from 1921 until 2005. Despite the founding of Rodef Sholom, Adath Jeshurun continued to grow in the 1910s. By 1922, the congregation had outgrown its synagogue and bought land for a new one. A newly formed Ladies Auxiliary helped to raise money for the new synagogue, and even donated the first $5,000 to the building fund. It took the congregation several years to raise the money, but Adath Jeshurun dedicated its new building in 1927. Showing the warm relationship between Newport News’ two congregations, the rabbi of Rodef Sholom spoke during the dedication ceremony. Adath Jeshurun also bought land and built a poultry slaughterhouse where its shochet could ply his trade. The congregation also had a free loan society to held members through financial crises and a Hachnoseth Orchim (welcoming guests) organization to help Jewish transients passing through town. In 1936, Adath Jeshurun hired its first ordained rabbi, Moses Goldberg, who stayed for six years. 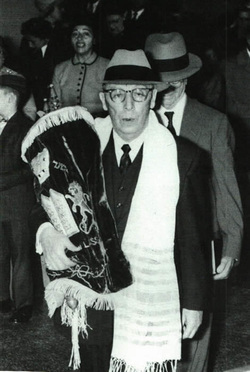 Rabbi Ephraim Kolatch replaced him, leading the congregation from 1942 to 1952. By 1946, Adath Jeshurun had 268 members - most lived in the vicinity of their stores on Jefferson Avenue downtown. While the congregation remained Orthodox, most members did not strictly observe the Sabbath, keeping their stores open on Saturday, the busiest day of the week. Harry Reyner at the dedication of Rodef Sholom. Photo courtesy of the Peninsula Jewish Historical Society. World War II transformed Newport News, with its shipyard and Fort Eustis and Langley Field bustling with soldiers and activity. During the naval disarmament of the 1920s and the Depression of the 1930s, the city limped along. The war ushered in a boom period for Newport News, while creating new challenges for the Jewish community. With a large number of Jewish soldiers stationed in the area, Newport News Jews helped to take in and entertain them. Working with the National Jewish Welfare Board, they turned the Graff Memorial Building, which had been constructed in 1921 as a Jewish community center, into a USO for Jewish G.I.s. Theodore Beskin was the head of the local Jewish Welfare Board. Before the U.S. joined the war, Jews in Newport News helped to rescue co-religionists from Europe. In 1940, the Lisbon-based S.S. Quanza carried 83 Jewish refugees seeking asylum. After being turned away at Veracruz, Mexico and New York, the ship docked in Norfolk. J.L. Morewitz, a Jewish maritime lawyer in Newport News, filed several legal actions to prevent the ship from returning to Europe and earn its passengers refugee status. After a groundswell of public support, including from first lady Eleanor Roosevelt, the 83 Jews were eventually given visas to enter the United States. William and Rosalina Morganstern, who settled in Newport News in 1922, worked to bring over as many refugees as they could. They signed as sponsors for 125 German Jewish refugees and convinced friends to sponsor 75 more. After the war, Jews in Newport News shipped livestock to Europe as part of the United Nations Relief and Rehabilitation Agency. Ben and Sol Levinson, who owned a livestock company that had been started as a meat market by their father Max, were the main providers, while veterinarian Seymour Glasofer checked each animal before it was shipped out of Newport News. Later, they shipped cattle to the newly established state of Israel. Rodef Sholom's synagogue in Hampton. Amidst the war, Jews in Newport News decided to centralize their fundraising efforts in 1942, establishing the Jewish Community Council. There had been a failed effort to establish such a council back in the 1920s. The council also led the United Jewish Appeal drives and served as the official spokesman for the Jewish community of the Peninsula. In 1947, they hired Charles Olshansky to serve as its executive director. At the time,12 different local Jewish organizations belonged to the council, including both Newport News congregations and their Sisterhoods, as well as the B’nai B’rith, Council of Jewish Women, Hadassah, the Zionist Organization of America, the Ladies Aid Society, and the Workmen’s Circle. In 1948, the council purchased a former USO building to use as a Jewish Community Center. The council also helped form a Jewish nursery school in 1948, and created programs for seniors at the JCC. In the late 1960s, the JCC moved to a new building. Since Jews had been an integral part of Newport News from the city’s beginning, they had long played prominent roles in civic life. Joseph Reyner served on the city council from 1910 to 1913, and his son Harry spent decades as a political leader in Newport News. Harry Reyner was first elected to city council in 1922, and remained a member of that body for three decades. He was appointed mayor in 1930, serving a two-year term. In the 1920s, Reyner helped organize and ran the Associated Charities. When a new, city-wide charity organization was established during the Great Depression, Reyner was its first president. Harry Nachman served as Newport News’ city attorney from 1945 to 1968, and was a key leader of the city’s redevelopment in the 1950s and 1960s. First elected in 1967, Alan Diamondstein represented Newport News in the state legislature for over 30 years. The Democrat was one of the most influential and productive members of the state house for many years. After serving on the city council for eight years, Joe S. Frank became the first Newport News mayor to be directly elected in 1996. Frank was re-elected three times, spending fourteen years as mayor. Walter Segaloff took over the regional chain of clothing stores started by his father Charles. After selling the La Vogue stores in 1992, Segaloff turned his attention to philanthropy, starting the “Achievable Dream” program to help poor and underperforming students. Working with the public schools of Newport News, the program was designed to alleviate poverty through education. In 2007, the program started the Achievable Dream Academy, running both a public middle and high school in Newport News. By 1948, over 1,700 Jews lived in Newport News and Hampton. 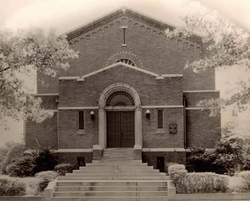 After experiencing post-war growth, Adath Jeshurun expanded its synagogue in 1949, connecting and refurbishing the adjacent Graff Building, which had been earlier damaged by fire. The congregation added a new auditorium, banquet hall, kitchen, and more classrooms. Despite this enlarged facility, many of the members of Adath Jeshurun had moved away from the Jefferson Avenue neighborhood, often buying homes in the new Stuart Gardens subdivision. In 1961, the Orthodox congregation followed their members, building a new synagogue in Stuart Gardens. From 1948 to 1964, Adath Jeshurun sponsored a joint Hebrew School with Rodef Sholom that met at the JCC. In 1982, Newport News’ only Orthodox congregation moved again, this time to a modern building on Nettles Drive. Rodef Sholom also experienced growth during the post-war era. By 1952, feeling they had outgrown their building, the congregation bought land next door to expand. This plan was put on hold after the proposed cost was too high. In 1954, the city of Newport News offered to purchase the synagogue and its land for $160,000 so they could create additional parking lots. The membership of Rodef Sholom agreed, and in 1956 vacated their building and acquired land in Hampton for a new synagogue. Dedicated in 1957, Rodef Sholom’s new synagogue did not have a dedicated sanctuary at first, as services were held in a multi-purpose room. The congregation did not build a formal sanctuary until 1980. A more immediate problem was classroom space, as the baby boom generation overwhelmed the new synagogue’s facilities. With 132 children in its religious school, Rodef Sholom added five new classrooms in 1961. Hampton’s B’nai Israel added its own new education building in 1946, buying a house next door to its synagogue and converting it. Rabbi Allan Mirvis led the Orthodox congregation from 1942 to 1974. In 1958, they moved to a new synagogue and sold their old building to a Unitarian Church. Although B’nai Israel was relatively small, it remained active, holding daily minyans into the 1980s. In the early 1950s, the Virginia Peninsula was home to three congregations: two Orthodox and one Conservative. In 1955, 20 families from Rodef Sholom broke away to establish the Peninsula’s first Reform congregation, Temple Sinai. Led by its first president, Emanuel Falk, Temple Sinai initially met at the JCC using a Torah lent to them by Rodef Sholom. While they used a student rabbi from Hebrew Union College in their first year, Temple Sinai hired Rabbi Allan Schwartzman as their full-time spiritual leader in 1956; the congregation numbered only 45 families at the time. 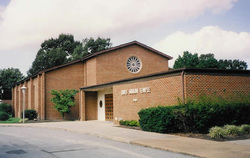 Yet Temple Sinai grew quickly, reaching 80 members by 1960. After five years of using the JCC’s basketball court as a sanctuary, Temple Sinai dedicated its first synagogue on Warwick Boulevard in 1960. The congregation continued to grow and employ full-time rabbis; by 1990 Temple Sinai had 194 contributing members. By 1980, the Peninsula Jewish community reached a peak of 3000 people. Since then, the community has slowly declined. In 2001, an estimated 2400 Jews lived on the Peninsula – a figure which included the growing Williamsburg Jewish community. Most of the congregations of Newport News and Hampton have shrunk in recent years. In 2010, B’nai Israel in Hampton closed due to its declining membership and sold their building to a church. The 20 remaining members joined Rodef Sholom and their Torahs and memorial plaques went to the Conservative congregation as well. Adath Jeshurun, which had 268 families in 1946, shrunk to only 35 families in 2013. They have not had a full-time rabbi in several years, and bring in a visiting rabbi to lead High Holiday services. 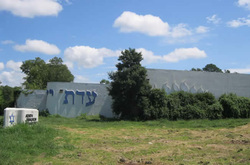 Facing a mold problem in their building, Adath Jeshurun closed their synagogue in 2009 and started meeting at the JCC, and in 2016 the Adath Jeshurun building was demolished. Temple Sinai was down to 105 members in 2012. 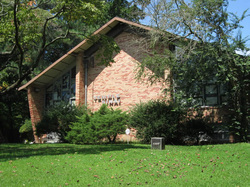 In 2013 after a dispute, 20 families broke away and formed a new Reform congregation, Emet V’Or, which meets regularly in Yorktown. While the Peninsula’s other congregations have struggled, Rodef Sholom has remained strong. With 240 families, the Conservative congregation is the largest on the Peninsula. Rabbi Gilah Dror became the congregation’s first female rabbi in 2001, and later served as president of the Conservative Rabbinical Assembly. Rabbi Dror still led Rodef Sholom in 2013. While the Jewish community of Newport News and Hampton has always been smaller than that of neighboring Norfolk, it has long been a vibrant community. Although their numbers may have declined a bit, Jews continue to play an active role in civic life while maintaining several Jewish institutions. In addition to the four congregations, the United Jewish Community of the Virginia Peninsula runs the JCC and oversees community fundraising. The Peninsula Jewish Historical Society, with archives and exhibits located in the JCC Building, has worked to preserve the important legacy of Jews in the area.